To Knit or Not to Knit motif hand-printed on organic black shirts using flex foil by Shirts of Berlin. 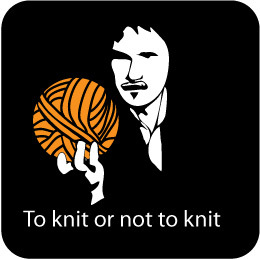 To Knit or Not to Knit? Now there's the question! 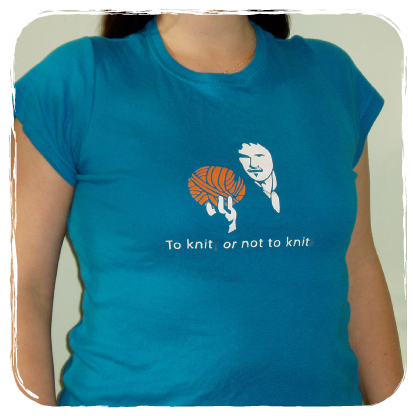 Even though the answer is obvious - to knit - the shirt is still a lot of fun, so get yours now! The face can be either white or beige, and the ball can be orange, neon orange, pink, red, yellow, dark or light blue, green, beige, glitter red or gold (the last two will cost 2 € extra). The postage for these shirts is 2 € for Germany and 4 € for the rest of the world. If you buy more than one shirt the postage fees might change, but will of course be combined.